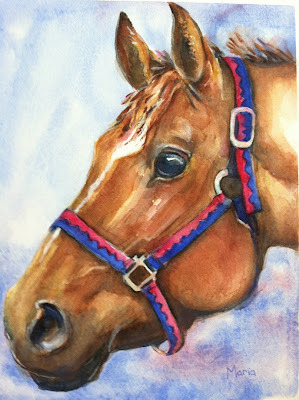 A friend of my daughter's, they show horses together, asked me to paint this horse for her mom's birthday, as a surprise. She sent me the photos, well in advance, and we planned the timing and the delivery without mom finding out. I was so touched by the effort and thoughtfulness of this young girl to go to such a big effort for her mom. Bottom photo was sent to me after she received it and framed it. This was such a fun project to work on. Her mom must love this thoughtful and lovely gift. The color and depth works so well and draws the viewer to it. Thanks Mary. It is always a challenge when you paint for someone else, want it turn out as they hope it will! Maria, her mom will love it. You have caught such a wonderful expression in the horse's eye.